When the West Coast Eagles and Collingwood faced off in the 2018 AFL Grand Final at the end of September, more than 100,000 people packed out the Melbourne Cricket Ground. With 100,022 attendees in total, this year’s game of games drew the largest grand final crowd since 1986. The record for attendees, however, is still held by the 1970 AFL Grand Final – which was then the VFL – at 121,686 attendees. Needless to say, the ultimate Aussie rules showdown certainly draws the large and excited crowds each year. Whether it be a sporting events like the AFL Grand Final or the revving of engines from the Australian Grand Prix that bring people to Melbourne, or the artistic endeavours on show at Tasmania’s Dark Mofo festival, major events – sporting, cultural or otherwise – will always draw large crowds and are a core part of life in Australia’s capital cities. For event organisers, the safety of those crowds in attendance is paramount, and something Darren Hotchkin, CEO of Saferoads, says was front of mind for the safety product specialist in the design of its latest innovation. “During the testing phase of our new HV2 barriers, we saw the recent spates around the world of vehicle intrusions into people, and we got thinking about how to prevent such things from happening again,” Mr. Hotchkin says. Bollards can be placed at strategic points at pedestrian public spaces, walkways and at other crowd-drawing locations such as stadiums to provide a certain level of safety, but Mr. Hotchkin says the key challenge for them was to design a portable bollard that could provide the optimal amount of protection against errant vehicles while allowing crowds to move freely between. “The other alternative is concrete barriers, but the problem with deploying those for major events is that they can block a mass flow of pedestrians if there’s a need to evacuate,” he says. Seeing a gap in the market, the Saferoads research and development team, including Darren’s son Tom – an engineering assistant with the business – set about developing a new, innovative product that could facilitate large crowds in case of an emergency evacuation. “We went through a lot of iterations in design to come up with a temporary bollard that could be rapidly setup for these kinds of events, and that’s how we came up with the OmniStop Portable Bollard System,” Mr. Hotchkin says. 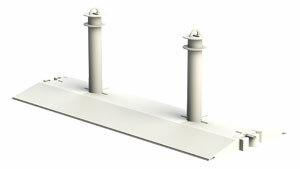 He believes the OmniStop Portable is a world-first portable bollard system that requires no anchor into the surface area. “The main use for it will be to protect people from vehicle intrusions – whether accidental or intentional – most likely at major sporting or cultural events. It’s designed to protect people from vehicle intrusions without blocking or impeding them from going straight through,” he says. The portable bollard uses the same concrete-filled base system as Saferoads’ HV2 Barrier, with Mr. Hotchkin asserting that the innovation comes from its ability to be deployed without impacting the pavement surface. “To incorporate the strength to stop the car and still have ability to allow safe pedestrian access meant quite a bit of work went into the design of the bollards and how they could connect with a low base,” he says. The result is a heavy unit, but one that maximises weight to ensure intruding vehicles can’t break through. 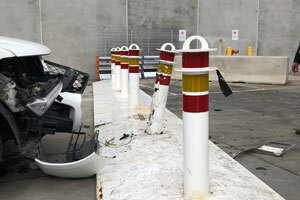 Saferoads conducted crash testing on the OmniStop Portable Bollard in October, with the system stopping a 2.3-tonne vehicle travelling at 60 kilometres per hour. The barrier is quick and easy to deploy, much like traditional concrete barriers, but provides gaps between the bollards that allow accessibility for prams and wheelchairs. “You could deploy about a kilometre of the OmniStop Bollard in about four hours with a three-man crew. The crew simply lifts the system off the truck and lays it in three-metre segments, installing with a simple pin system as you go,” Mr. Hotchkin explains. As a completely new kind of barrier system, with no formal standard in Australia, Mr. Hotchkin says the OmniStop has garnered immense interest far and wide already. Locally, Mr. Hotchkin says organisers of major events have also shown growing interest in the OmniStop Portable Bollards, as well as major hire and rental companies around the country, which sets Saferoads up for the future.